Our deep nestbox design is very safe for owlets due to a 460mm drop from the entrance hole to the bottom and an exercise platform with a raised edge. If you’re tempted to think that the design doesn’t really matter – these photos will surely make you think again. 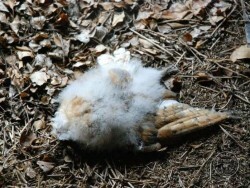 Every year, nestling Barn Owls fall from poorly designed nestboxes and sadly die. Young Barn Owls can walk from 3 weeks old, but they can’t fly until they are around 8-9 weeks old. 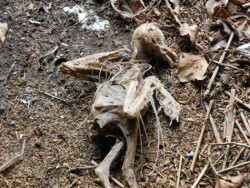 Fallen owlets are ignored by adults. They either starve or are taken by predators. 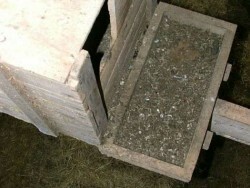 Poorly designed nestboxes with the entrance hole on the same level as the nest are a cause. This box has an exercise platform that has no edge..
Nest debris can build up inside so that the internal drop is greatly reduced. 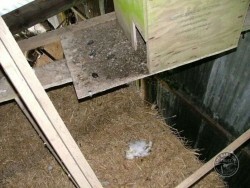 No exercise platform means owlets can fall straight from the nestbox opening. 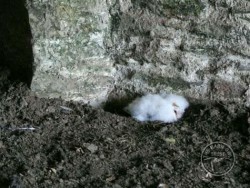 The entrance hole to this box is still too low leading to a fallen owlet. Boxes must be maintained. 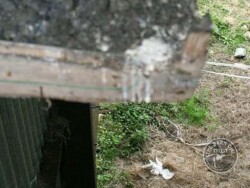 Jackdaws will fill a box with twigs very quickly. 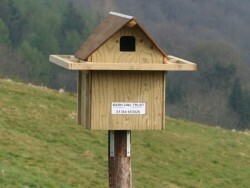 We have been recommending deep nestbox designs since 1997, but poor designs are still widely available. 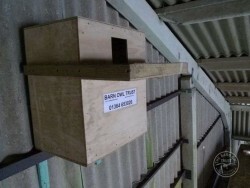 So what can be done to keep Barn Owls safe at sites where the only available nesting place is an old, unsafe box like this one? 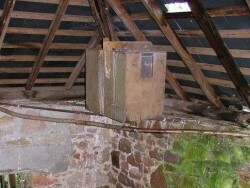 Put up a new, safe box in a higher place and leave the old box in place for at least a month. There is every likelihood that the owls will move straight across. 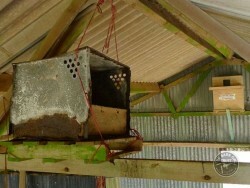 We have monitored hundreds of deep boxes since 1997 and owlets rarely fall from them, if they are properly maintained. Deep tree boxes too! 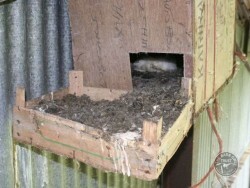 The exercise tray and flat roof enable fledglings to get from the box into the tree and back more easily. The ultimate polebox! This super-deep nestbox features an exercise platform that goes all the way around, providing maximum safety for emerging young. Another poor design . 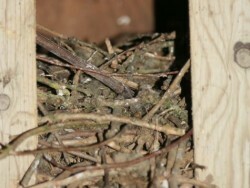 . .
Two owlets fell from this nestbox from the same brood. 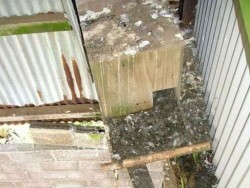 If only the nestbox had been of a better design. 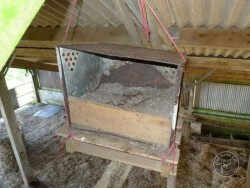 Choose the right nestbox. In a building, on a tree or up a pole – which box is best for your site? 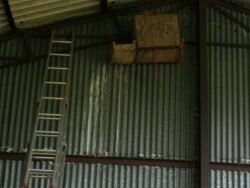 How to build an indoor Barn Owl nestbox. Free plans! 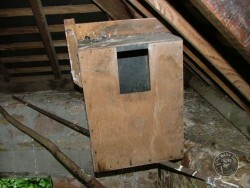 Where to position a Barn Owl nestbox in a building. 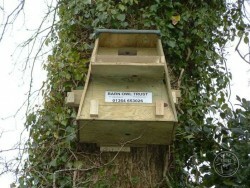 Buy a ready-made owl box.